From western wildfires to Superstorm Sandy to the super soaking the Seattle area received in November, weather swept the headlines in 2012. For Washington state residents, perched on fault lines with wilderness at their doorsteps, disaster preparedness is second nature. Earthquake insurance is common and most homeowner policies cover fire. Yet flood insurance remains a mystery for many. It is not included in most standard policies, but it is federally mandated for residential structures in designated flood zones. The Federal Emergency Management Agency (FEMA) has overseen flood insurance nationwide since 1968. Through its National Flood Insurance Program, local insurance brokers can become licensed to sell flood insurance to their clients. “Anybody can become a national flood insurance agent, through national wholesale brokers,” explains Joe Snapp, principal of Snapp & Son, a Seattle insurance company founded in 1937 and originally specializing in maritime shipping insurance. But, he estimates, the majority of agents licensed to sell flood insurance do so only a few times a year because the process is so convoluted. While FEMA makes and distributes flood zone maps to consumers, piecing together an accurate insurance estimate requires understanding of structural engineering reports, maps, policies and databases. 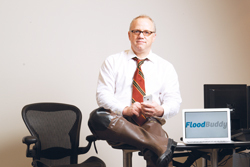 Snapp & Son’s answer to this situation, FloodBuddy, turns buying flood insurance into one-stop shopping. Users can access FloodBuddy online or through an iPhone app, and need only type in an address to see a “visual quote” in which rates and flood zone maps are presented together and colorized. The quote is a live offer from which a user can immediately purchase flood coverage. Sometimes, FloodBuddy needs more data and asks for a phone consultation. Stephen Schramke, head of marketing for FloodBuddy, says, “Joe is doing for flood insurance what Zillow has done for home appraisals.” FloodBuddy consolidates what Snapp describes as a minimum of 10 phone calls and faxes among banks, surveyors, insurance agents and customers into one or two exchanges before generating quotes for customers. Beta-launched in 2011, FloodBuddy now accounts for about 25 percent of the firm’s phone call activity, says Snapp, with customer interest growing markedly after Hurricane Sandy’s devastation. Climate change and coastal development also make flood risk a moving target, so FloodBuddy is constantly updating its databases to alert policyholders and potential customers.